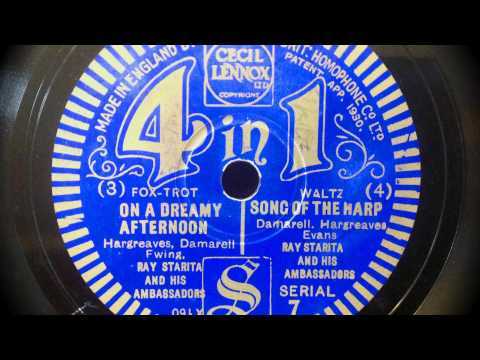 “On a Dreamy Afternoon.” Lyrics by Robert Hargreaves and Stanley J. Damerell, with music by Montague Ewing (1932). Recorded by Ray Starita and His Ambassadors’ Band on September 15, 1932, with vocals by Elsie Carlisle. Four-in-One 7. Ray Starita’s version of “On a Dreamy Afternoon” was made in 1932, the last year of his recording career and one of the best, when his band included such greats as Nat Gonella and Nat Star. 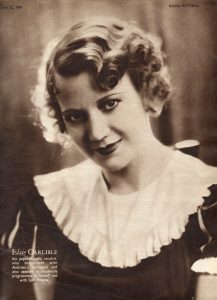 It was also the only year he used Elsie Carlisle as a vocalist, though he did so quite a bit, turning out excellent recordings of “Kiss by Kiss,” “Let That Be a Lesson to You,” and “I Heard,” amongst others. “On a Dreamy Afternoon” has music and lyrics that are mellow and atmospheric and showcase nicely the sweet quality of Elsie’s voice — this is definitely not one of her torch songs, and there is nothing particularly naughty in it — it is soothingly beautiful and romantic. Other versions of this song were recorded in October 1932 by Arthur Lally (Maurice Elwin, vocalist), Jack Hylton and His Orchestra (with vocals by Pat O’Malley; hear the unissued take 3 on jackhylton.com), and Carroll Gibbons and the Savoy Hotel Orpheans, with Cavan O’Connor singing).